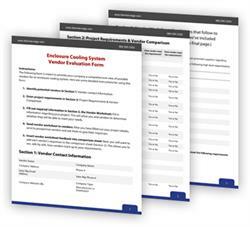 IRVING, TX--(Marketwired - March 11, 2015) - Thermal Edge, Inc., a leading manufacturer of temperature control products for electrical enclosures, announced today that it is publishing a worksheet that will help companies compare the capabilities and services of multiple cooling vendors. 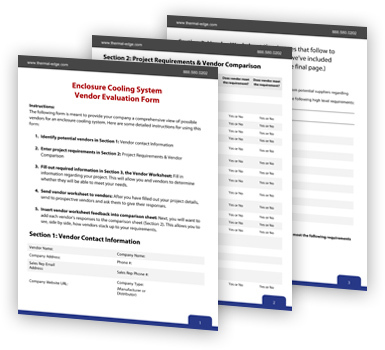 The Enclosure Cooling System Vendor Evaluation Form is available with free downloads at www.thermal-edge.com/enclosure-cooling-vendor-evaluation-sheet. "Due diligence must be followed for any company looking to hire an enclosure cooling system vendor," says Andy Cohen, President of Thermal Edge, Inc. "The last thing an organization wants is to hire a provider that doesn't suit its needs. Our worksheet gives companies a comprehensive resource to compare vendors and find ones that are perfect for their projects." Thermal Edge, Inc., is a leading manufacturer of electrical enclosure cooling products, including air conditioners, air-to-air heat exchangers, and fan systems. With clients such as PepsiCo., Bacardi, MillerCoors, Kraft, Black Box, and Motion Control Engineering, Thermal Edge designs temperature control solutions sold directly to customers as well as through distributors such as Fastenal and Grainger. For additional information about Thermal Edge products, visit the company's website at www.thermal-edge.com.